2002 U.S. open 9-Ball Championship . Sept. 29, 2002 . 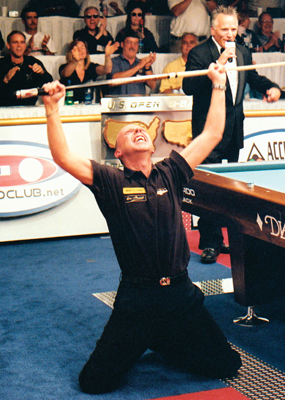 Chesapeake, Va.
At 10:25 p.m. on Sept. 29, Ralf Souquet pocketed the final 9 ball of the 2002 U.S. Open. Such an exact time is usually relegated to tidbit trivia, but the 2002 championship was the first pay-per-view production in pool history. The live satellite feed for the broadcast, produced by the Billiard Club Network and Accu-Stats Video Productions, was set to go to black at 10:28. By ending the final in the 24th rack, 13-11, Souquet saved the producers the embarrassment of a case-game blackout that no doubt would have resulted in remote controls smashing off TV screens in homes around the world. The biggest challenge in pool's experiment in PPV appeared to be managing the length of a game notoriously free of temporal restraints. The PPV broadcast began with a 25-minute intro, including a bagpipe performance and pre-recorded interviews with the finalists. Once the players took to the table, racks split and runouts were quick and effortless as Souquet took a 5-1 lead. Then the gears got a bit sticky. Pagulayan's soft breaks often left racks congealing at various points around the table. Safety battles ensued; producers began to sweat. With 45 minutes of airtime left and the players knotted at eight games apiece, BCn frontman Rob Sykora implemented a 30-second shot clock. Souquet and Pagulayan continued to jaw shots and play safe. Two games later, the shot clock was trimmed to 25 seconds, with no extensions. Trailing 10-9, Pagulayan finally looked like he was finally finding his stroke. He cleaned up a rack after a Souquet miss, then broke and ran the next for his only lead of the match. Souquet, however, came with a gutsy kick on the 5 ball to draw even, then cleared the next rack to climb on the hill, 12-11. 10:18 p.m. Ten minutes until broadcast blackout. The Kaiser failed to drop a ball on the break, leaving Pagulayan a runout that surely would have sent the match beyond the 10:28 deadline. But to the relief of everybody involved with the PPV production, Pagulayan jarred an easy 3 ball, then fouled after a Souquet safety. With ball in hand, the German star hopped around the table, firing in the last five balls for a heart-stopping 13-11 win. Dropping to his knees, Souquet raised his cue over his head and unleashed an adrenaline-fueled, "Yes! Yes! Yes!" Announcers and tournament officials flooded the arena floor. A hasty closing filled the final seconds of the broadcast. Then it was 10:28. The feed went to black, but not before a conclusion had been reached. Standing off to the side of the chaos, Pagulayan looked dejectedly upon a victory celebration that could have been for him. "It was too crazy at the end," he said. "We didn't lay well because of that. You don't have enough time to think. And on that last ball I missed, I was thinking too much about the clock." In spite of the quick shot clock, Souquet hit his stride late in the match. Meanwhile, Souquet offered his take on the TV producers' mid-match improvisation. "When you're told you're running out of time, what are you going to do?" Souquet said, champagne bottle in hand. "You can't make decisions, you just have to get down as fast as you can and shoot." While Souquet has rarely been accused of being a speed freak at the table, he thrived in the pressure-packed environment. "I said, 'Put us on a shot clock,'" he said. "You can get yourself into a rhythm with the clock." As any script for the final match went out the window, Souquet remained in the moment, knowing he was so close to something so glorious. "There was lots of pressure," he said. "But I kept telling myself, 'If you lose now, you gave away what will probably be your best chance to win the U.S. Open." He made the most of that chance, with just moments to spare.